A wildfire that burned around 40 acres, threatened homes and prompted evacuations in the Oak Meadows subdivision south of Glenwood Springs late Friday, June 22, settled down that night and was absent of any flare-ups on Saturday. Extra firefighting resources were on standby Saturday as a Type 3 Incident Command team from the Upper Colorado Interagency Fire Management took over operations. Firefighters from multiple agencies assisted Glenwood Springs Fire when the blaze first broke out about 4:30 or 5 p.m. Friday and quickly spread to the south of houses on Aspen Way in the southern (upper) part of Oak Meadows. The area is located off of Four Mile Road on the way to Sunlight Mountain Resort. 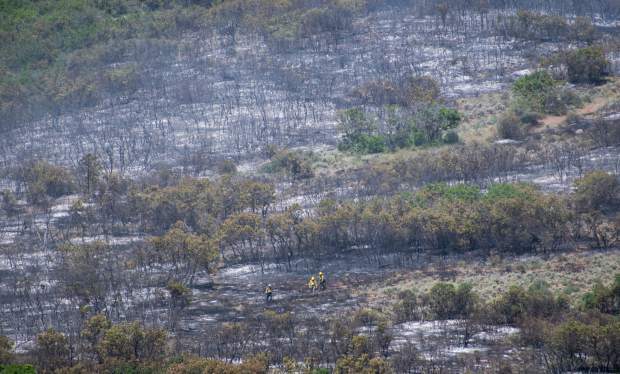 “No structures have been lost … however the fire advanced to within a few hundred yards of some cabins and buildings in the area,” Garfield County Sheriff’s Office spokesman Walt Stowe said in a midday press release Saturday. “The goals for today’s crews are to protect structures, minimize spread of the fire and protect the safety of the residents,” he said. “We had really good success last night getting a wet line around the fire area,” Glenwood Springs Fire Chief Gary Tillotson said Saturday as the lower-level Type 3 incident command team was mobilizing and giving area firefighters a break. A base camp was set up at the Sopris Elementary School, where fire fighters were to be camping overnight.